Deze oceaan villa en cottage zijn gelegen op 1000 meter van afgelegen-maar niet afgelegen, oceanfront op het meest noordelijke punt van Grand Cayman. Je ziet en ervaren van 20 voetbalvelden van oceaan tot aan jezelf! Dit is een luxueuze eigenschap die geen ander huis van Cayman kan bieden. De familie Appleman heeft in de afgelopen 18 jaar aan meer dan 800 gezinnen gehuurd. We zijn trots op onze 28 vijfsterrenrecensies! Je hebt gestruikeld over een geweldig juweeltje van een eersteklas vakantieverhuur. Vraag naar onze last-minute huurkorting (binnen 30 dagen). • Meer dan 800 gezinnen hebben genoten van deze accommodatie. - Fantastisch DUIKEN & SNORKELEN aan de achterkant van het huis in een beschermd rif met zeewaterparken, inclusief de beroemde noordmuur. - Panoramische duikwinkel in de straat (Reef Divers) om boot- en kantduiken op te zetten. - We bieden discounted scuba diving, Stingray City trips, catamarancruises en strand-watersporten via Red Sail Sports. We hebben Avis-huurauto's met korting. - Duikshop Reef Divers 'is drie minuten rijden. - De eigenaar gaat om de paar maanden naar beneden om te controleren of alles in perfecte staat is. - De eigenaar stuurt u een 100-tip lijst met favoriete restaurants, duikwinkels en bezienswaardigheden. Perfect, als je nog nooit in Cayman bent geweest! - Beroemde Ristorante Pappagallo ligt verderop in de straat. - HET UITZICHT: Elke slaapkamer heeft een adembenemend uitzicht op het Caribisch gebied. De twee grote slaapkamers hebben hun eigen Franse deuren tegenover het Caribisch gebied. Je kunt hetzelfde prachtige uitzicht vanuit de woonkamer, eetkamer en keuken ook zien. - Een eigen platform, met trappen en ladder, voor ervaren, bekwame snorkelaars en diverse oceaantoegang. Kinderen onder de 12 mogen niet achterin snorkelen. Onze dochter, Danielle, echter, snorkelde terug op de leeftijd van vijf jaar oud, vergezeld door haar ouders. De eigenaar is een ervaren duiker en zal graag vragen beantwoorden over snorkelen en duiken vanuit huis. -AMAZING EN SPECTACULAIR leven in zee en koraal. -In je eigen achtertuin heb je maagd snorkelen en duiken dat is ongelooflijk! - Professioneel ingericht met mooi antiek, olieverfschilderijen en oosterse tapijten. - Buiten dineren beschikbaar op grote picknicktafel, beschutte veranda of drie cocktailtafels. We hebben trouwrecepties en huwelijksreizen geboekt! Zie de foto van de dochter van de eigenaar, Alaina, op de website. We houden van ontspannen koffie in de ochtend en cocktails bij zonsondergang. Als je een duiker bent, kun je ervoor zorgen dat Indepth Watersports naar je huis komt en je escorteert met een rondleiding met gids vanuit de achtertuin van Cayman Coast Escape! Lovely place. Beautiful view. We enjoyed staying there. I wanted a house with 4 bedrooms, an equal number of bathrooms and a pool and this offered all that and more for a reasonable price! 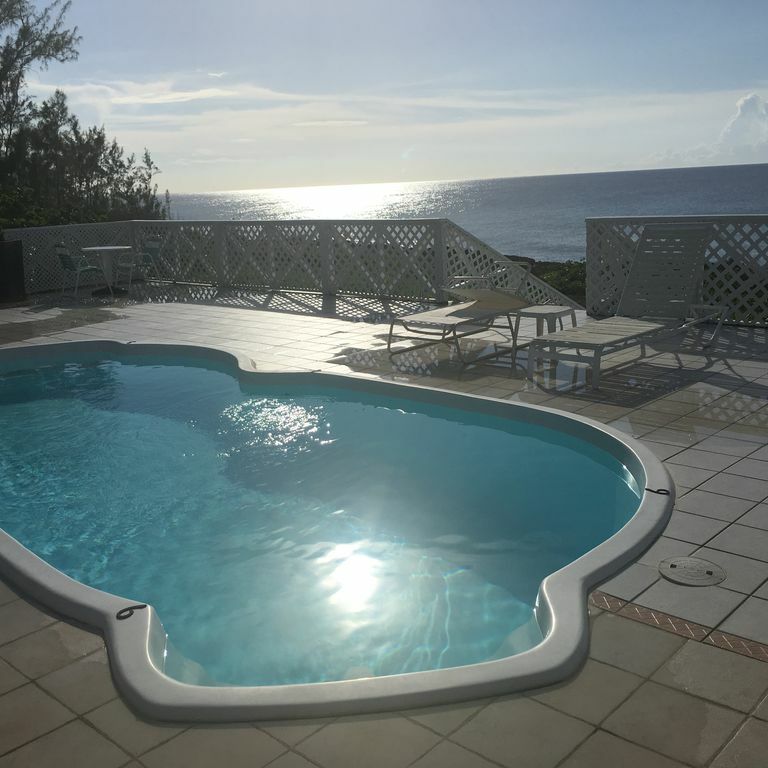 There is also a wonderful view of the ocean and the location offers privacy and peace and quiet.The house is very comfortable with ample space for all of us. The kitchen is large and open to the dining area with a large table for everyone. You can see the ocean from almost every room which is wonderful. The house really felt comfortable and we all felt at home there. Not only is the house lovely, but the owners were both delightful. We were lucky to have the opportunity to meet them since they were renting down the street for part of the time that we were there. They not only dropped by at our convenience but also were very generous in treating us to drinks at the Calypso Grill which is a restaurant not to be missed! Soon after booking the house, the owner called us to welcome us and was always receptive to answering any questions that we might have. He suggested restaurants and snorkeling spots and I never had to wait for an answer. I have rented from VRBO before and never have I had just a helpful and engaged owner.I had never been to the Grand Cayman's before and I didn't know anything about the island. I rented this house for the house, but now having driven around the whole island, I would say that West Bay is a very nice place to be. We had more privacy than we would have had in Georgetown or Seven Mile Beach and yet it was close enough to those areas to easily go there. I would definitely recommend this house and would be happy to rent it again myself. We were blessed to usher in the New Year with our dear friends on the wonderful deck overlooking the ocean. We thoroughly enjoyed the pool, the beautiful view, and gathering in the screened porch for our morning coffee! The Appleman family loves that you welcomed the New Year under the stars at our home. On a clear night, it can be breathtaking. Thank you for our 38th five star review. Please come back for a 30% discount. A beautiful place in which to relax. The owner, Michael Appleman sends out a wonderful list of recommendations of where to eat and what to do while on the Cayman. In his list he includes that one of their favourite things to do is enjoying spending time at the house and just sitting on the deck. How true that is. Waking each morning and having one's coffee and breakfast sitting in the porch or on the deck cannot be beat. The view is spectacular and one really slows down and relaxes. Michael and the Appleman family, thanks so much for sharing your home with us. All the best for a happy and health 2019. We engaged in at least five or six wonderful, stimulating conversations. It would be our honor and pleasure meeting you face-to face. Happy 2019 to you and your family! Nothing but health, wealth, success and happiness. Please return for a 30% discount. The view was amazing. The house was very cozy and clean. The owner and manager were very responsive to our needs and questions. We would definitely stay here again. Celena, you were a fine guest. We want you to return for a 30% discount. Thank you, thank you for our villa's 36TH FIVE STAR REVIEW! We spent 9 days at this perfect waterfront home. We came to GC for the diving and with this home it was everything we needed. Plenty of room, well appointed and terrific for easy shore diving off the backyard. This is our second time stay here and it's as good as we remember. Thank you so much for twice-booking our villa and cottage. It is guests like you, who appreciate the spectacular diving-right in your backyard, that make renting our home so meaningful! Please re-book our for a third time and receive a 35% discount.